I carved this rubber stamp this evening. 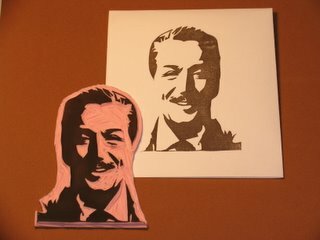 Walt Disney was such a part of my world growing up - and probably your's as well. Every Sunday evening we all gathered around our television set as he introduced us to his Wonderful World. Heck Yeah, Mr. Disney was the man of the hour each Sunday night! I dreaded the fact that the next day was school, but that show eased the pain! LOL! Now, if I could just get that Bonanza theme song out of my head! That really made me miserable on Sunday nights! Your stamp does Walt justice Mija. The detail and sharp image are great. Love it! Glad you liked the Walt stamp! I am digging the 'instant gratification' of stamp carving..and there is just something about the 'smoothness' of it that unwinds me..a 'natural high' kinda thing. WHAT? You did not have a crush on Little Joe??? I never watched the Bonanza or was is Bonanaza? SEE what I mean?! But I did watch The Twilight Zone and I found the dark haired host charming in a wierd way! LOL! HEy, maybe you could bring him back! LOL! Oy Loca! Twilight Zone stamps would be a kick to make! Recently Jill was commenting how Rod Serling was SO ahead of his time. Do we ever tire of those old T.V. shows? Thank the god's for Twilight Zone marathon's! Hey I love the greeting card idea. I'll funnel my thoughts your way, if it's comic relief your looking for, the mushy stuff I'm not so good at. (I get embarrassed) Let's talk. You go girl...hey latent Hippie greeting cards, for those of us who AREN'T baby boomers, AREN'T young adults....I know we're tweenies....in between young and old, yeah tweenies that's what we are and proud of it! Do You Ever Feel Like Daffy Duck?